Jordan is amongst the turmoil and instability that currently grips the Middle East, and is a small country that many people overlook. A historical safe haven, Jordan is full of wonderful delights waiting to be explored. It is a country that combines vast desert landscapes with beautiful beach resorts. From lush green forests to dusty, built up limestone cities, it is a place worth putting on your travel bucket list. Below are some of the must-visit places in Jordan, and a taste of what makes this desert country so enchanting. 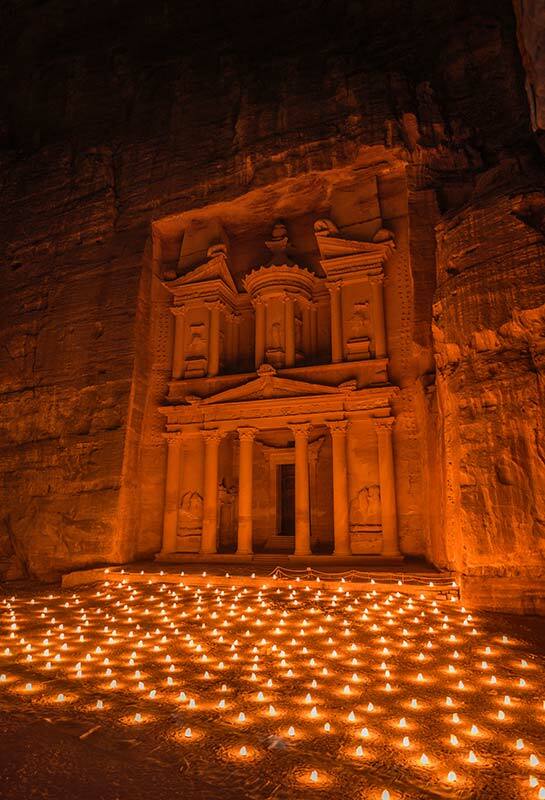 Petra, is one of the new seven wonders of the world and is a must-visit place. Located in southern Jordan, it is incredible evidence of an ancient civilisation when the Nabataean Arabs carved out a city from stone over 2000 years ago. From historical enthusiasts to hikers, this vast archaeological site is Jordan’s biggest attraction. A day is plenty of time to explore the Rose-Red city, so called due to the colour of the rock from which it was carved. You can take a walk through a narrow 1km pathway with rose mountain walls, at the end of which you will come to the breathtaking facade of the ancient Treasury. 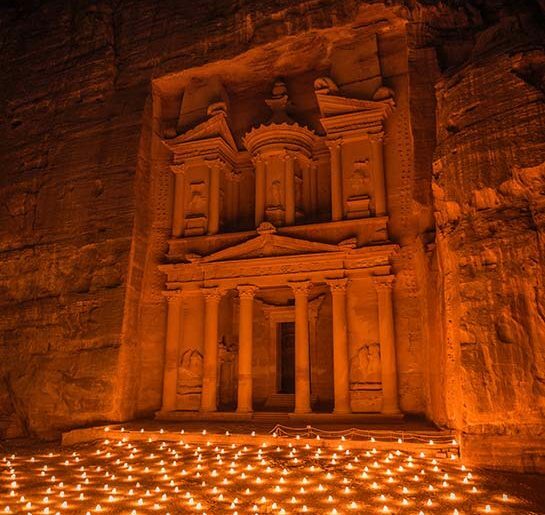 This is the most visited attraction of Petra. Continuing on you will come to strangely beautiful tombs, and an eerie amphitheatre. The steep scenic incline will then end with the equally breathtaking site of the Monastery. Travellers often spend the day marvelling at the history in Petra and continue on for a night in presence of stars in Wadi Rum. For city dwellers especially, a night or two in the striking red deserts of Wadi Rum can be a real treat. The environment, in appearance, vastly resembles a depiction of Mars, and thus it is a favourite site with moviemakers. Located in southern Jordan, a night in Wadi Rum is a great way to experience a taste of the nomadic life. You can drive off-track to enjoy spectacularly colourful sunsets, and spend the nights in bedouin campsites which cater to travellers. A day hiking around Petra followed by a night spent in a traditional bedouin setting can be an experience of a lifetime. You huddle up around campfires with sweet mint tea, enjoy rhythmic and thrilling drumming, and dig into lush freshly cooked food. It will all give you a physical and mental reset like nothing else. Jordan truly is a country that offers all. Aqaba is a wonderful coastal city is located in southern Jordan and can be a practical base from which to explore the rest of the country. For snorkelling and diving enthusiasts, the red sea offers a spectacular underground world to explore. The calm waters and ideal temperatures have truly aided the development of beautifully rich sea life. The Aqaba Bird Observatory is also a bird-watcher’s dream. It is situated close to the Eilat border and is home to flocks of birds arriving from Africa, Europe and Asia during the migration season. The emerald-green and luscious wetlands strike a beautiful contrast to the rest of the desert landscape. The best time to gaze upon multitudes of spectacular birds passing through is Spring and Fall. 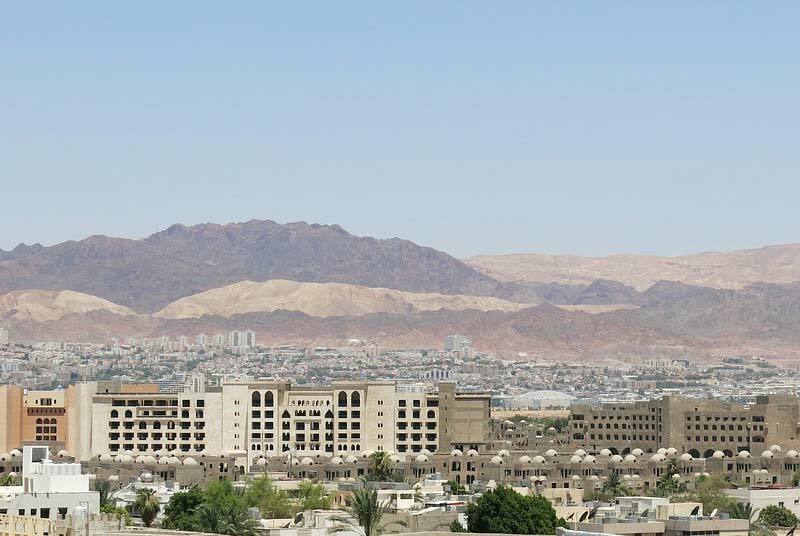 A few days in Aqaba is ample time to shop, explore the city and enjoy the sea. You can spend a morning exploring Mamluk Castle, and enjoy the warm waters of Palm Beach in the afternoon. There are numerous restaurants offering freshly cooked and delicious seafood for you to enjoy. 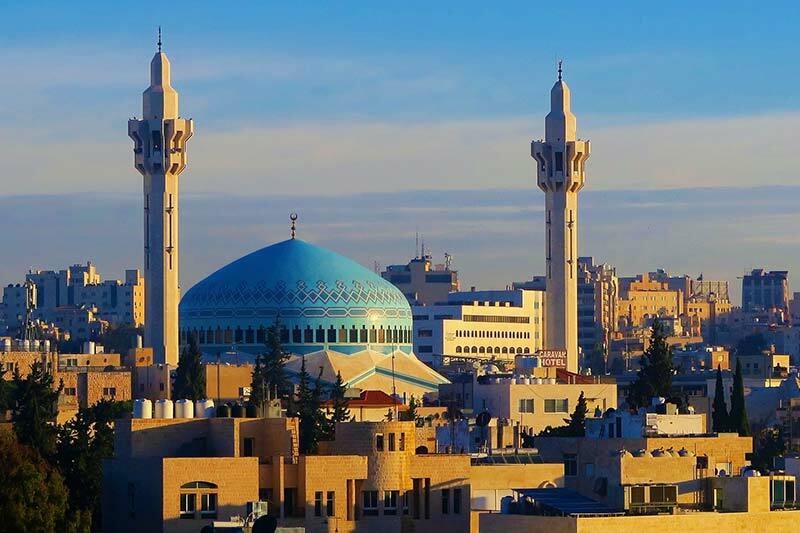 Amman is a truly unique city. 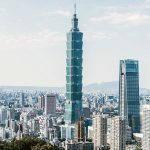 It combines the old and new, as well as the traditional and the modern to create a dynamic and unique culture. There are numerous historical sites to discover and explore in this vibrant capital city. You can spend a day visiting the Citadel and Roman Amphitheatre which are located Downtown. The streets of this old part of Amman are filled with nostalgia. The narrow allies are also packed with shops and stalls, and is the optimal place to buy small souvenirs and support the local craftsmanship. Spend an afternoon strolling down Rainbow Street in Jabal Amman, which is nestled in the old part of Amman. 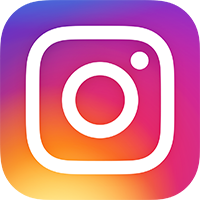 Here you will find quaint and attractive coffee shops to enjoy. There are also many artists studios located in the vicinity, giving you a glimpse of the many facets of this fascinating country. The local cuisine is a real treat for any foodie. There are many affordable restaurants that serve the national dish called mansaf which is tender lamb served on a bed of aromatic and nutty rice, draped in a wonderfully warm fermented yoghurt sauce. For vegans and vegetarians, freshly fried crispy falafels and smooth, golden hummus are also a delicious introduction to authentic middle eastern cuisine. Famous for its healing muds and salty waters, the Dead Sea is a must-see site in Jordan. It is arguably a large salt lake and is the lowest elevation point on Earth. 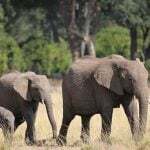 The mineral-rich mud has therapeutic properties that draws travellers from across the globe. Floating in the Dead Sea is a must and the waters will relax tired muscles while the mineral-rich mud softens and illuminates your skin. There are a wide array of hotels along that coast that offer excellent treatments, spas and accommodation. A night or two spent here can be a great getaway from the hustle and bustle of the larger cities. An option to consider includes the Dead Sea Spa Hotel. This fascinating city is home to one of the best preserved Roman towns in the entire world. Jerash boasts of civilisation dating back over 6,500 years. The engineering and design of the city was so remarkably advanced that much of it still stands today. In a day trip from Amman, you can visit this architectural triumph with ease. From the Hippodrome to the Oval Plaza appreciating the structural genius of this vast archaeological site will involve some walking. This enchanting little country truly has must-visit places to satisfy every taste. The Ma’in Hot Springs are a popular attraction with locals as well as tourists.The waters originate from the winter rainfalls in the highlands of Jordan and eventually come into the hot and cold springs of the valley. It is reported that Herod the Great bathed in the springs, and since then people have traversed from far and wide to enjoy the therapeutic and mineral-rich hot waters. In this idyllic location is a first class spa and resort which offers a wide range of professional services. From underwater massages to exquisite mud baths, a day at the Ma’in Hot Springs will give you an experience of royal standards. These must-visit places in Jordan will give a little taste of the numerous experiences and opportunities this country has to offer. From desert treks in Wadi Rum to bathing in hot springs, a trip to Jordan will be a unique cultural experience that compares to little else. 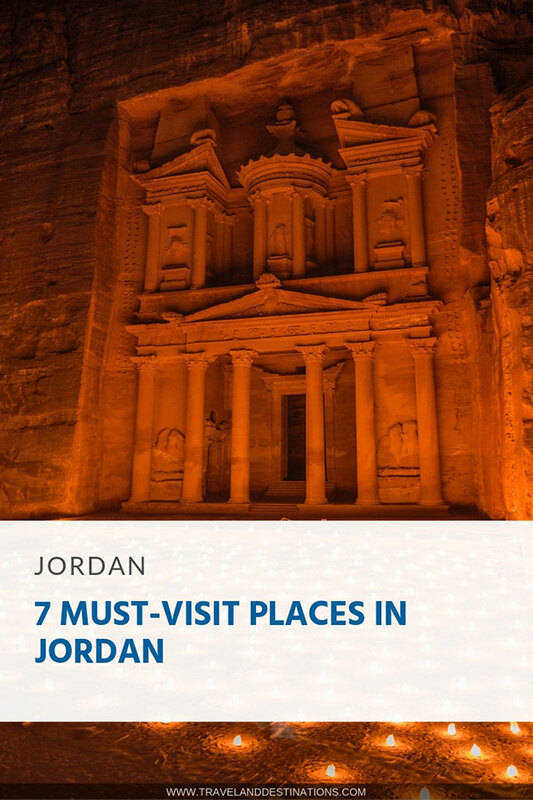 Hey Buddy!, I found this information for you: "7 Must-Visit Places in Jordan". Here is the website link: https://www.travelanddestinations.com/must-visit-places-in-jordan/. Thank you.